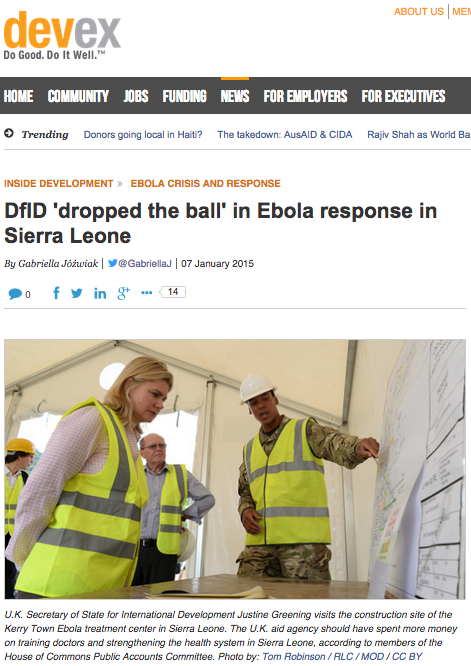 "Senior UK Department for International Development officials have admitted the body made mistakes in its response to the Ebola outbreak in Sierra Leone, while also suggesting how the department could respond better to similar crises in future. DfID’s chief scientific adviser and director of research and evidence professor Chris Whitty told a panel of influential members of Parliament that the department had “multiple lessons” to learn as a result of the viral epidemic in Sierra Leone, which has now topped 9,000 cases — more than any other affected country in West Africa. Whitty's comments came during an evidence session held by the House of Commons Public Accounts Committee — known as PAC — which is investigating whether DfID’s response to the ongoing epidemic is providing value-for-money to the U.K. taxpayer. PAC Chair Margaret Hodge asked Whitty why, during DfID’s years of involvement in Sierra Leone since the end of the country’s civil war, it had not invested more in programs to strengthen the health system..."